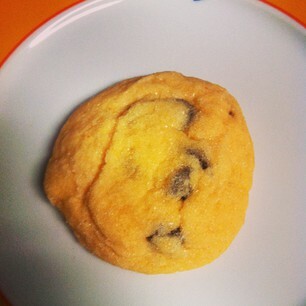 It is a little out of the ordinary to make cookies on a weekday, I usually make cookies on the weekend. I was out of town this past weekend and did not get a change to make some. I like to have cookies for my lunch, and so I made some since we were out. So....I found a package of Orange Jello in the cupboard and a bag of chocolate chips. Bingo! 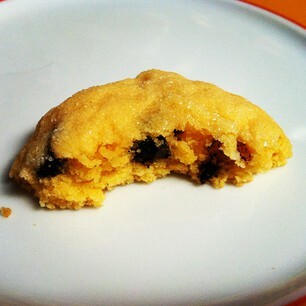 Orange Jello Chocolate Chip Cookies are born! So first I had to find a Jello cookie recipe, and I found one here. So here is my version using the recipe. 1 cup (or half of a 12 oz bag) chocolate chips. Cream butter, shortening, sugar, Jello, orange zest, orange juice, eggs, and vanilla. Sift flour, baking powder, and salt. (I did not sift my dry ingredients, worked out o.k.) and mix in with the creamed ingredients, add the chocolate chips. Make one inch-ish balls, coat the balls in granulated sugar, place on baking sheet about 2 inches apart. flatten cookie with bottom of glass. Bake in 350 degree oven for 8 minutes. Cool on wire rack and store in airtight container. Your special cookies need to be in my cookie jar, yummy! Have a great St. Patrick's Day and thank you so much for sharing with Full Plate Thursday!